We have already read in the previous article that in 1765, Britishers got the DIWANI rights of Bengal, Bihar and Orissa. They were the revenue collector now. 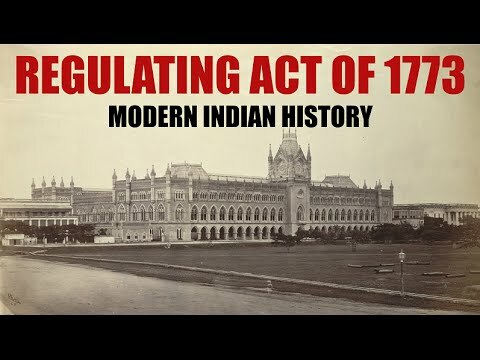 The immediate reason of Regulating Act 1773 coming into picture was that East India Company applied for a One Million Pound loan from British Government in August 1772. So obviously it comes to our mind that in spite of gaining the revenue collection rights of Bengal, Bihar and Orissa 8 years back what exactly went wrong that the company had to apply for a loan. 1. As a result of the Battle of Plassey(1757) and the Battle of Buxar(1764) the area of Bengal and Bihar came under the system of Dual Government(DIWANI & NIZAMAT). As a result of which the British got the license to exploit the people of these areas without being accountable to anyone. The people of these provinces were being suppressed and exploited by both - Company Official and Nawabs. So the British Government had to Intervene. 2. Due to these exploitative practices, the people were literally reduced to beggars. This was a major reason of the Great Bengal Famine of 1770. 10 million perished because of this famine. The famine was spread in the period of 1769 to 1773. One important thing to note is that no famine occurred in that century before. The famine reduced the revenue of East India Company which worsened its financial condition. 3. The servants of the East India Company were grossly corrupt from bottom to top. Even Clive was known for his corrupt attitude. Clive and other English officials have benefited heavily from the Nawabs of Bengal. This corruption took the company to near bankruptcy which was compounded because of reduced revenues due to famine. The Company servants had earned so much money that some of them retired to live lavish lives resembling the lives of Indian Nawabs. These corrupt infamous English Officials were also known by the name ENGLISH NAWABS. 4. British Government was willing to know and regulate the affairs of the East India Company in India. At this time they didn't have enough control over the affairs of the East India Company. 5. The three presidencies of Bengal, Madras and Bombay were independent of each other and there was no centralised authority in India to control them. All three presidencies were answerable separately to the Court of Directors in England. The Court of Directors were 24 in number. The affairs of the East India Company were under the control of the Court of Directors which were 24 in number. 1. Controlling and Regulating the affairs of the East India Company was important. The officials of the East India Company were running the company almost independent of the British Parliament and was resembling some sort of a sovereign political entity which in any case was not acceptable to the British Parliament. 2. Extreme amount of corruption was prevalent in the company's servants. That needed to be removed. 3. The hue and cry that was caused due the Dual Government system had to be sorted out. 4. Recognising for the first time Political and Administrative functions of the East India Company. 5. Starting a sort of Central Administration in India. 1. The Governor of Bengal was redesignated as the OFFICE OF THE GOVERNOR OF THE PRESIDENCY OF FORT WILLIAM also known as Governor General of Bengal. The first person to hold this designation was Lord Warren Hastings. Also the Governors of Madras Presidency and Bengal Presidency were made subordinate to the Governor General of Bengal. An executive council of four members was created to assist the Governor General. 2. The Company officials were prohibited from accepting any bribes or gifts from the local people. They were also disallowed from engaging in any private trade. Engaging in private trade was the biggest incentive for the Company Officials posted in India. 3. Supreme Court of Judicature at Fort William was established at Calcutta in 1774 with one Chief Justice and three other judges. Sir Elijah Imphey was appointed as first Chief Justice. The court covered under its jurisdiction all areas lying under Bombay, Madras and Bengal Presidency. It was a Court of Record and had the power to try both Civil and Criminal cases. It also exercised jurisdiction over Admiralty cases. It considered the social and religious customs of the Indians while pronouncing its judgements. 7th line of first point of key provision is Bengal presidency which should be Bombay presidency.